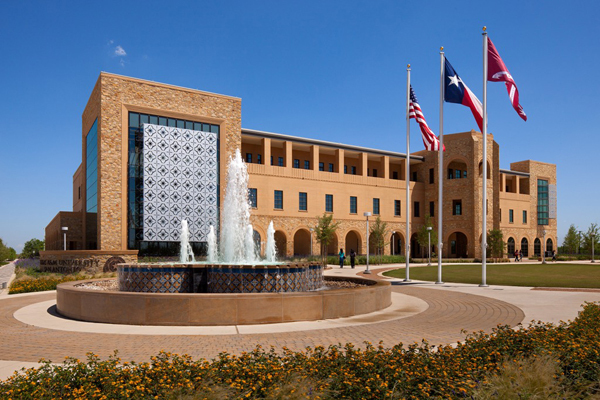 The Senator Frank L. Madla Building is located at the Main Campus of Texas A&M University-San Antonio. The address is One University Way, San Antonio, TX 78224. West-facing windows incorporate use of sunshades made from cut aluminum panels reminiscent of the hojalata pressed metal craft that is native to south Texas. The design of these decorative panels draws from the imagery found on Mission San Jose in south San Antonio. Intricately detailed brickwork on the building draws from the south Texas tradition of brick architecture found on the best-loved buildings in the region.